A ceremony to award economic development grants to regions of the state was overshadowed by developments on the federal tax overhaul plan in Washington, as the House and Senate announced agreement on a final plan to be voted on as early as next week. The annual event, held near the holidays, usually has a festive atmosphere as hundreds of civic leaders from around the state come to the Capitol to cheer millions of dollars in grants awarded. 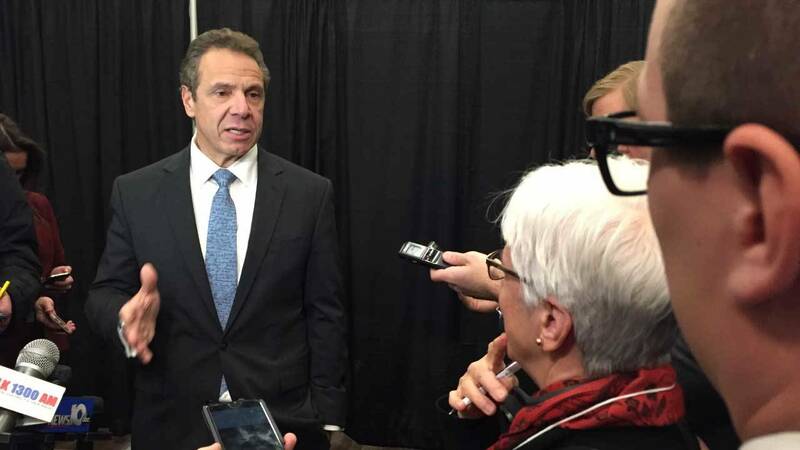 But this year, during his remarks, Cuomo was more focused on the tax plan and its negative effects on New York, saying it will be “devastating”. Speaking to reporters afterward, he said the bill’s end to deductions for state and local taxes, and new limits on the mortgage deduction threaten to undo his efforts to hold the line on taxes and spending.The governor has imposed a property tax cap and kept state spending growth to around 2% per year. The governor says he sees a hopeful sign in the results of the Alabama elections Tuesday, where voters rejected Republican Roy Moore, who was accused of sexually harassing teenagers. He says the women in Alabama stood up and said they did not want to be abused, and he predicts the public will also rise up against the tax overhaul plan. “This is abusive to the taxpayers in New York as their position was abusive to the women in Alabama,” Cuomo said. Cuomo is a moderate to liberal Democrat, but many Republicans in the state are also against the federal tax plan, including five of the state’s nine Republican Congressmen and women. The conservative-leaning think tank The Empire Center is analyzing the tax overhaul plan, and also concludes that it won’t be good for New York. The Empire Center’s EJ McMahon says while he thinks Cuomo sometimes uses overblown rhetoric to describe the impact of the tax overhaul on New York, he says the governor isn’t wrong that the changes could greatly disrupt the state’s budget and economy. He says the majority of lower income and middle-class taxpayers will gain from the policy, but the higher taxes that will result for richer New Yorkers, and the loss in home values will have a negative ripple effect. “And this poses a considerable challenge,” McMahon said. McMahon, a former aide in the administration of former GOP Governor George Pataki, has been a long time advocate of lowering New York’s spending and taxes, which are higher than most other states. But he says this is not the way to achieve that end. McMahon says it goes against basic conservative philosophy and principals that put a state’s rights above federal policies.